Rep. Duncan Hunter (R., Calif.) urged President Donald Trump on Tuesday to pursue funding for the U.S. Coast Guard to purchase new ice-capable vessels to counter Russia's military buildup in the Arctic. Hunter, who chairs the House Subcommittee on Coast Guard and Maritime Transportation, warned in a letter to Trump that Russia is set to debut the world's largest nuclear-powered icebreaker, Arktika, while the United States struggles to maintain its two 1970s-era icebreakers. "The Coast Guard is being forced to order parts online and cannibalize older vessels to maintain a minimum level of operability—just to operate a single heavy icebreaker," Hunter wrote. "Meanwhile, Russia is launching its biggest icebreaker—the Arktika. It should be of tremendous concern that next to this vessel, there is no equivalent in the world," he wrote. "In other words, Russia is not just exceeding the U.S. in icebreaker production and Arctic presence, they're in a class by themselves and setting a standard, supported by enhanced capability, that is unmatched." 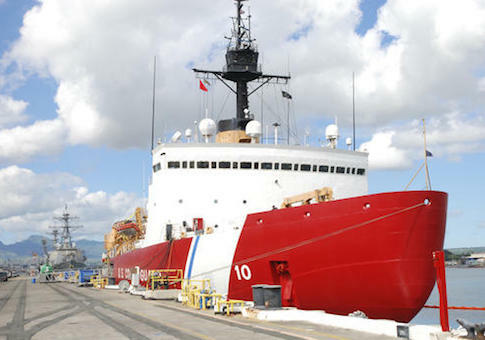 Hunter, a former Marine, said the Coast Guard has a "critical" need for at least six additional icebreakers, three heavy duty and three medium duty, to project power and advance strategic interests in the Arctic. "It's not the Navy that will be responsible for patrolling the Arctic. It's the Coast Guard," he wrote. "Funding for six new icebreakers must be a high priority to ensure the Coast Guard can begin undertaking a more expansive Arctic mission without any further delay. Hunter wrote a similar letter to Defense Secretary James Mattis and Homeland Security Secretary John Kelly on Friday urgently requesting they support the development of six new icebreakers. Sen. Dan Sullivan (R., Alaska) warned earlier this month that the United States is falling behind in the Arctic amid Moscow's push to expand its military presence through a rapid buildup of icebreakers and ice-capable infrastructure. Russia recently built 14 airfields and arctic ports, four new Arctic brigade combat teams, and 40 icebreakers, some of which are nuclear powered. It is developing another 11 icebreakers. Russian President Vladimir Putin is also moving to re-open shuttered Soviet military, air, and radar bases on remote Arctic islands, marking the biggest military push by the Kremlin in the region since the Cold War. In December, the Pentagon released a strategic report urging Congress to approve additional funding for the department to modernize infrastructure, expand its naval fleet, and enhance training and exercises in the region. This entry was posted in National Security and tagged Duncan Hunter, Russia. Bookmark the permalink.